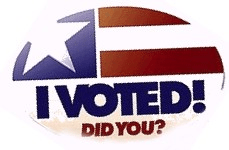 Is it a good thing to exercise your right to vote? Yes, it is, in the abstract, no matter who you actually vote for, I suppose. Probably. Given the lackluster choices we are typically presented with, though, and how polarized many areas have become, it is at least understandable that some citizens might choose not to exercise their right to vote in any particular election. And that is their right, too. It's not a valid reason to run somebody over, is what I'm trying to say. Nothing funny about the injury itself, as always, but I did find the first news clip at the above link very amusing because they put the cameraman in an SUV and drove it around while the reporter pretended to hide behind the light pole. We get it, local news. Can't we all just get along? No, of course we can't, but we can successfully not kill each other over politics. Of that I am relatively certain. Probably.